This week students will be able to participate in electing Douglas Students’ Union representatives and deciding the future of the school’s U-Pass agreement with the province and TransLink. The candidates for this year’s election are all members of the “Team Action” slate and are running entirely unopposed for all positions. Nominations for candidacy closed on February 1. 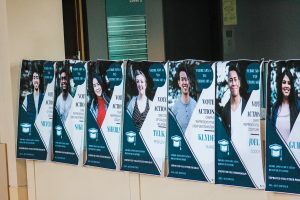 “Students typically organize themselves to run together and all students are welcome to put their names forward to run for the Board of Directors given they meet the requirements set out in the DSU Bylaws,” said College Relations and Membership Outreach Coordinator Tracy Ho, in an email to the Other Press. Telka Pesklevits, who is running for Director of College Relations, explained Team Action’s platform in an email to the Other Press. “Team Action wants to stay focused on services, advocacy, and events,” said Pesklevits. Their mandate is separated into three main areas of focus: events, services, and campaigns. Events encapsulated popular DSU initiatives such as the fall beverage garden social, monthly pub nights (and similar events for all ages), and free food events. Services covered improving their volunteer programs; helping to combat food insecurity among students through the college’s emergency food bank service; incorporating the new Anvil Centre into Douglas activities to reach the students who attend classes there; utilizing newly renovated spaces; and promoting the new legal aid line available to students. For campaigns, Team Action will continue to promote the “Open Textbooks” campaign; advocate for a tuition fee increase cap on international student fees; encourage students to vote in the upcoming federal election; and campaign the provincial government to eliminate interest on student loans. “We will promote multiple other campaigns [as well] that are currently in the works at the provincial level such as Grants not Loans and Fund the Future,” said Pesklevits. There is no registered No campaign for the referendum.